The North American re-issue of the X-Plus Toho 30cm Series Yuji Sakai Modeling Collection Godzilla 1989 from Diamond seems to be delayed. It was, and still is, listed as having a release date of February 22. But this figure has not even gotten on the cargo ship yet. And trips across the ocean typically take one month (one and a half with bad weather). Stay tuned for more news on its new release date. What IS on the boat is this guy: the 12inch Series Godzilla 2004. He’s on his way and it’s looking like he’s going to make it on time for his mid-March release date. Remember those second batches Diamond was trying to set up for the Kaiju which came out early last year? Well, it’s happening. On the cargo ship with Godzilla 2004 are a bunch of 12in Series Anguirus, Titanosaurus, Space Godzilla and Kiryu figures. These new runs are probably not as big as they were in 2016. So if you need one that’s sold out right now, get ready to act. They’ll be here in mid-March. And, let’s not forget Bluefin. Their reissue of the Large Monster Series Biollante is still due at the end of the month! 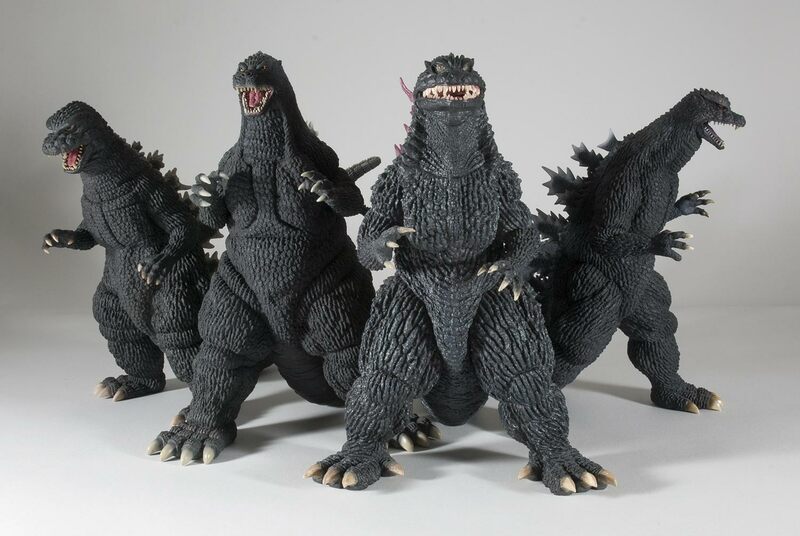 Diamond Distributors, sole license holder for X-Plus 30cm Series vinyls in North America, has just announced the upcoming availability of the Godzilla 1984(1985) Godzilla 1992, Godzilla 1999 (2000) and Godzilla 2004 (Final Wars) vinyl figures. The 12in Series Godzilla 1984 (Diamond Stock #STK684130), of course, hails from the film “Godzilla“, also known as “The Return of Godzilla” which came out in Japan in 1984 and later in the U.S. as Godzilla 1985. The Toho 30cm Series Godzilla 1984 vinyl figure by X-Plus was originally released in Japan in 2013. Note: a 30cm Series Godzilla 1984 was on loan to Diamond for display at Toy Fair in New York last February. It had a hinged jaw and many collectors wondered if we were getting that version (myself included). But I asked X-Plus directly and found that we are not getting a hinged jaw. It will be set in the open position just as the original was. • See my Kaiju Addicts 30cm Godzilla 1984 Review of the original release. It’s one of my earlier reviews so you may notice a slight difference in format. • Expected Release: November, 2016. The 12in Series Godzilla 1992 (Diamond Stock #STK684133) features the king of monsters as he appeared in 1992’s Godzilla vs. Mothra: The Battle for Earth which also featured Mothra and Battra. 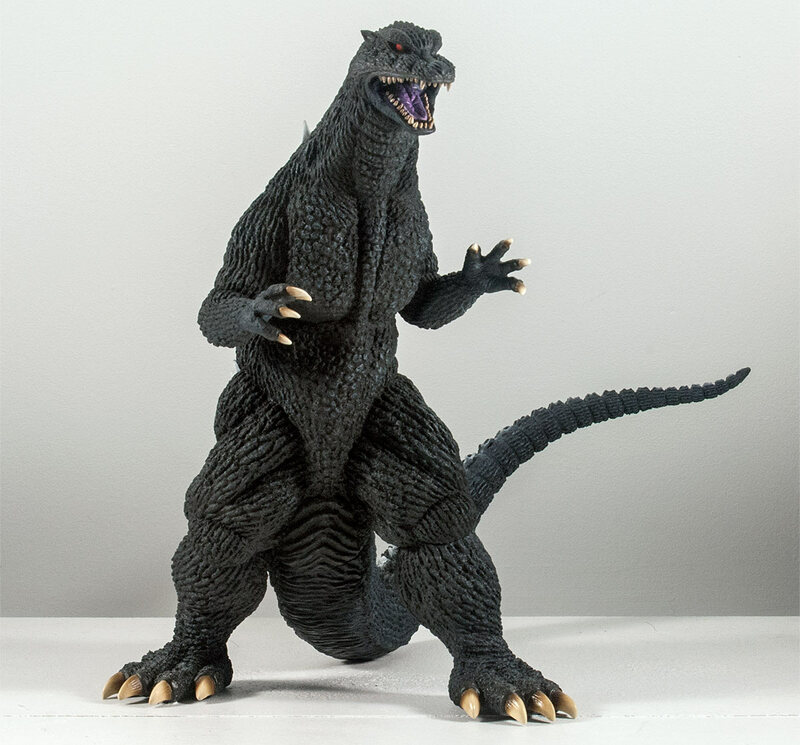 The Toho 30cm Series Godzilla 1992 vinyl figure by X-Plus was originally released in Japan way back in 2011. 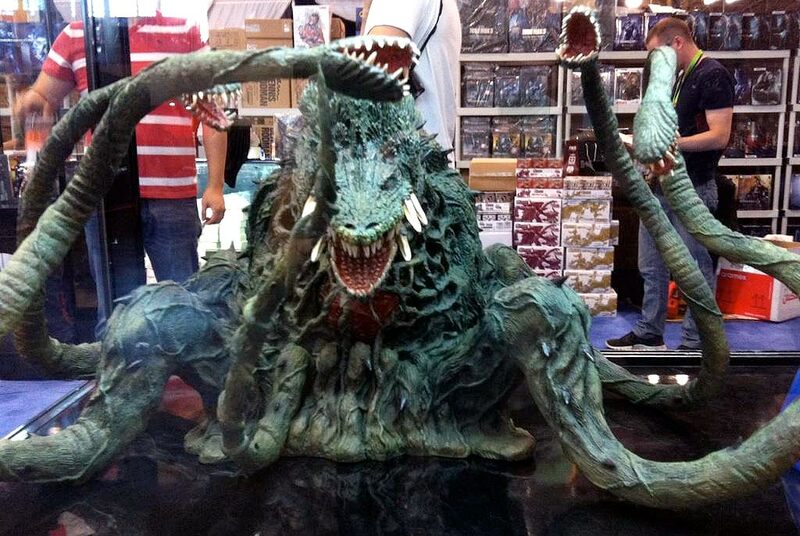 The Toho 30cm Battra Larva, due out in Japan next month, comes from the same movie as the Godzilla 1992. Get ready to pair them up! • Expected Release: January 25, 2017. 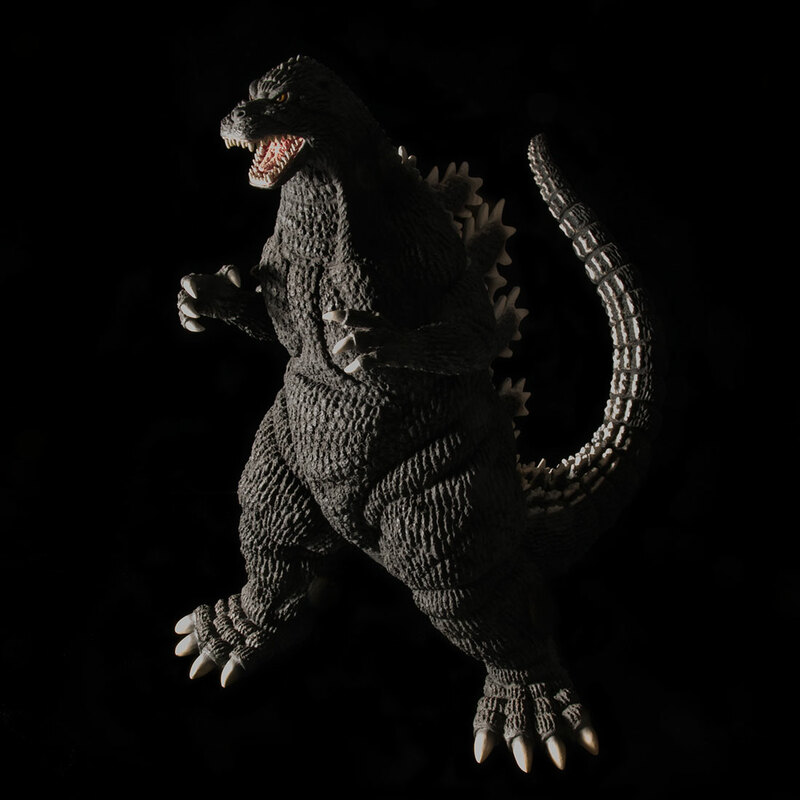 The Godzilla 12in Series Godzilla 1999 2K Millennium version vinyl figure (Diamond Stock #STK684134), is based on Goji’s appearance in Godzilla 2000: Millennium. The original release came out back in 2013. I believe this will be this figure’s very first re-issue. • See my Kaiju Addicts 30cm Godzilla 1999 (2000) Review of the original release. • SRP $160. Expected Release: March 29, 2017. The Godzilla 12in Series Godzilla 2004 Final Wars version vinyl figure (Diamond Stock #STK684131) features the final form which Godzilla was to take until the upcoming Shin Godzilla (Godzilla: Resurgence). This figure was re-issued only once before as a Wonder Festival 2015 exclusive. • Pair this one up with the 30cm Series Gigan 2004 scheduled to come out next month (July 2016). • See my Kaiju Addicts 30cm Godzilla 2004 Final Wars Review of the original release. • SRP $160. Expected Release: May 31, 2017. Comic shops and online retailers have until June 20, 2016 to place their big orders. So, if you intend to order these from your local comic store, make sure they know the deadline. Pre-orders from online retailers will extend beyond that date and run until each store’s number of customers matches the number of figures they’ve ordered from Diamond by the retailer deadline. So, it will not be unusual for you to see pre-orders still being taken after June 20. So far, pre-orders are being taken by myself (Kaiju Addicts) from the family business, Flossie’s Gifts & Collectibles for $149 each. You can now reach our X-Plus selection at Flossie’s with this new, easier URL: GetXPlus.com. They are also available from Vampire Robots for $170 shipped. Big Bad Toy Store is taking orders for $169.99. More stores will soon follow once they catch on that they’re available. This is a great opportunity for new collectors and those who had missed out on the initial releases! Toy Blog and News Sites: Contact me if you need high res photos for your own news posts on this story. I’d be glad to share! 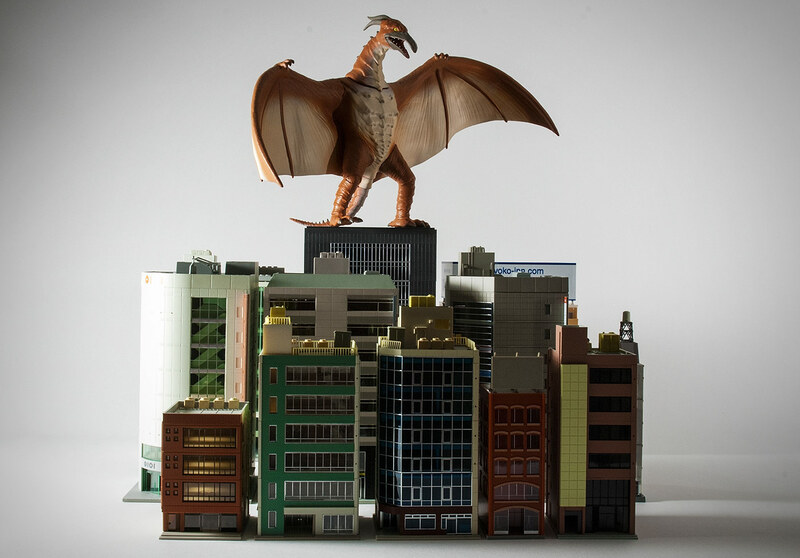 GodzillaFanFreaks reviews the Toho 30cm Series Gigan 1972 (Diamond Reissue) X-Plus. See more of his reviews at GodzillaFanFreaks Youtube Channel. Diego Doom reviews the Toho 30cm Series Anguirus 1968 Diamond Reissue vinyl figure (known in U.S. comic stores as the Godzilla Kaiju 12 inch Series Anguirus 1968. See more of Diego Doom on his YouTube Channel. 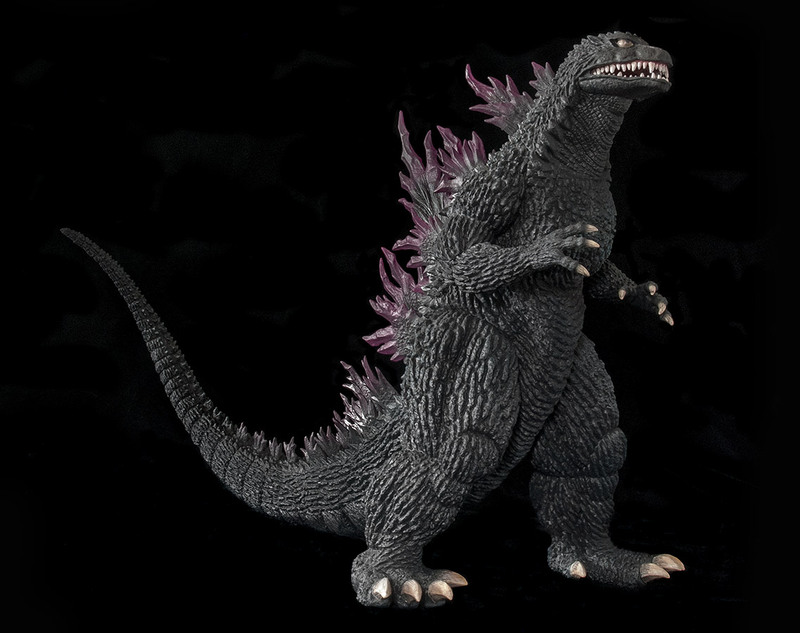 Leslie Chambers reviews the Toho 30cm Series Godzilla 1964 vinyl figure by X-Plus. This review covers the North American reissue distributed by Diamond, but it’s the same sculpt as the original. See more of Leslie’s reviews at his YouTube Channel. 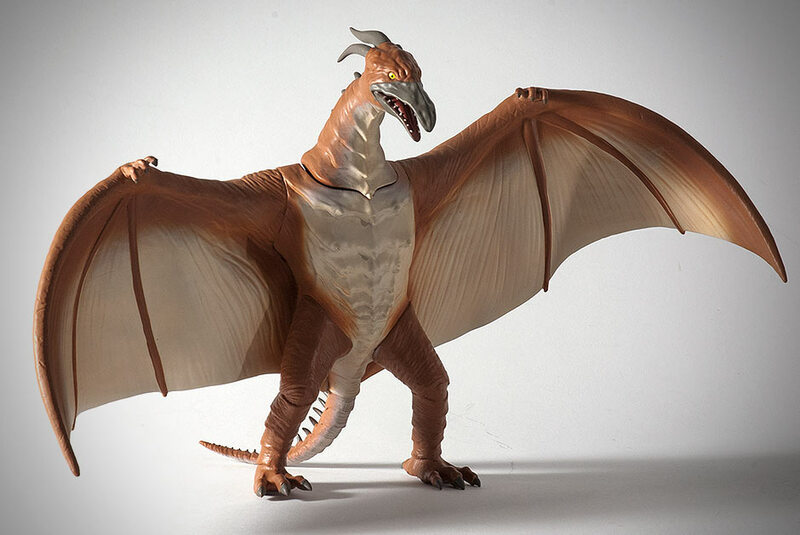 I don’t usually review the cheap stuff, but the recently released Rodan 1993 Figural Vinyl Bank by Diamond Select Toys keeps catching my eye. I got the urge to talk about it so here I am with my third “Not X-Plus, But…” figure review. Standing a little over 9 inches (22cm) tall, Diamond’s Rodan bank has a wingspan of about 15 inches (38cm). It’s very sturdy and is very stable standing on its own. 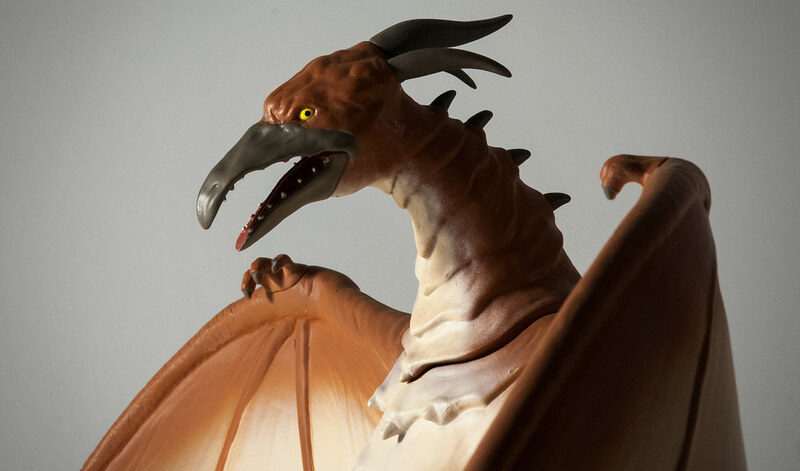 Sculpt-wise, it totally captures the essence of the Heisei Rodan from 1993’s Godzilla vs. Mechagodzilla II. I wouldn’t say it’s perfect, though. The torso seems a bit wide. Because of that, and it’s lack of good detail, I’d have to say it may be considered slightly stylized. Being an X-Plus collector and a realism buff, I originally dismissed this “bank” when I first saw it. But, seeing as how Rodan 1993 is totally unrepresented in my collection, I got one. What the hell? It’s only SRP $29.99. It was when I walked passed it a few times today that it started to catch my eye. Rodan 1993! I got a little tinge of excitement even though this figure is pretty crude when compared to the X-Plus quality which I’ve become accustomed to. But, I love seeing that Heisei Rodan head when I walk by it! But, that gappy seam at the base of the neck bugs me. And then I remember, this is a bank. You can insert coins into a slot on the figure’s back and retrieve them by removing the head. 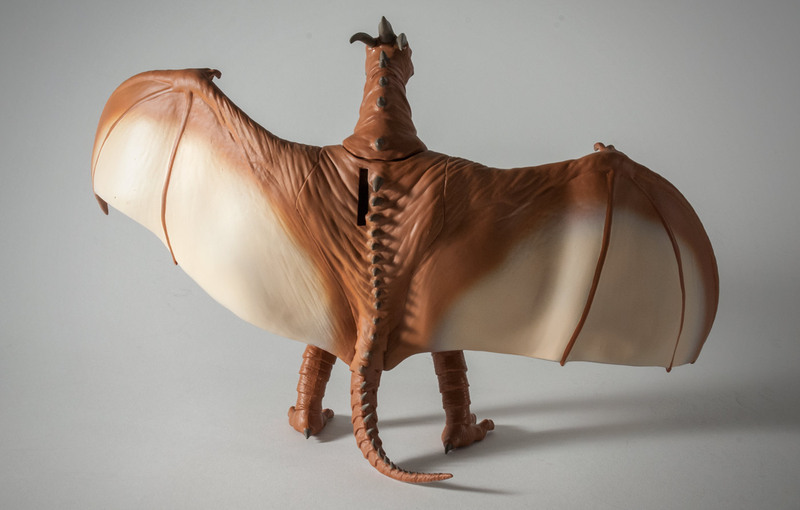 Why the hell anyone would want to save a fist full of coins in a Rodan figure is beyond me. I can’t help thinking that turning a figure into a “bank” somehow puts it into it’s own licensing category or something, and thus the only way Diamond could make these. The head is on fairly snug but will give way with a slight back and forth tug. 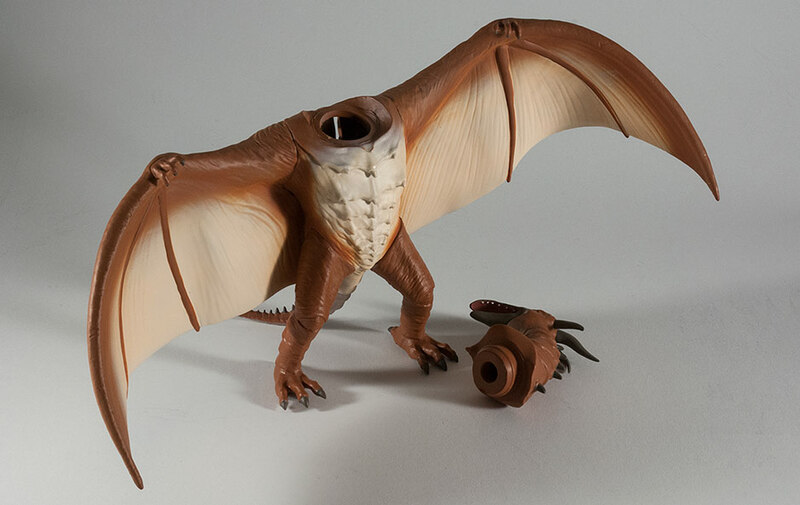 Note: when you receive your Diamond Select Rodan Bank, the gap under the head may be much more pronounced than you see in this mini review. That’s just because the factory didn’t insert them on all the way. You can easily tweak it on tighter after you de-bag and de-tag it. But, be careful when you do! Rodan’s beak and head “spikes” are fairly sturdy, strong and sharp. Keep this in mind if you plan on giving it to your kid as a “Don’t Touch Daddy’s X-Plus, Touch This Instead” figure. 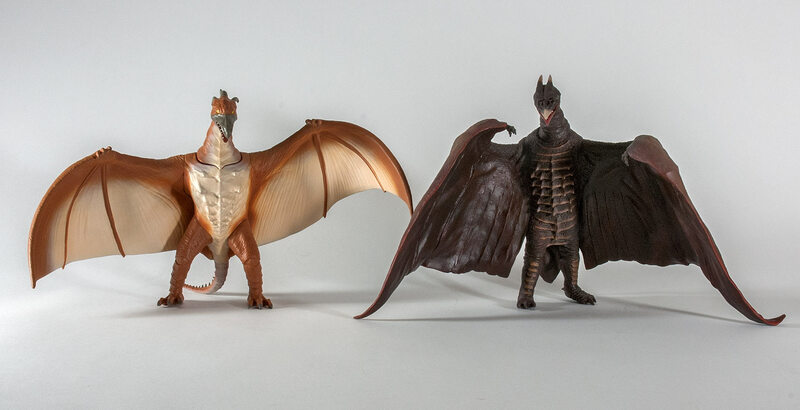 The Diamond Select Rodan 1993 Vinyl Bank is around about the same size as the two Showa Large Monster Series Rodan figures by X-Plus. Here you see it with the Large Monster Series Rodan 1956. If you don’t mind mixed quality on your shelves and scale is not an issue for you, then this bank would look good in your 25cm series collection. Serendipitously, this bank is almost in scale with the X-Plus 30cm Series. Seen here with the X-Plus 30cm Series Godzilla 1992 (closest relative available from X-Plus), Rodan is a bit taller than he need be to be in scale with Godzilla. Remember, Rodan was a little guy in 1993. So, again, if you don’t mind mixed quality on your shelves, this bank is an “okay” fit with your X-Plus 30’s. And, don’t forget: as mentioned in my Gee Okamoto Interview, X-Plus plans to begin work on a Mechagodzilla 1993 figure next year! This thing makes me HUNGRY for an X-Plus version. For now, this will have to do. The Rodan 1993 Figural Vinyl Bank may be subpar for X-Plus and resin kit purists, but if your collection is a bit more eccentric, this thing is pretty damn nice. Especially for the low SRP of $29.99. Please note that this bank is seen here in somewhat dramatic lighting and won’t look as good out of the bag… unless you apply your own dramatic lighting. Just released, you can grab this thing practically everywhere. You’d do best to find one at a local comic store so you don’t have to worry about dishing out an extra $10 or so for shipping. Flossie’s Gifts & Collectibles has them ready to ship for $25.99. Vampire Robots has them for $25. Amazon has them for $31. Details on the upcoming X-Plus/Diamond Reissues keep changing. In an attempt to catch up, I asked Diamond’s purchasing manager some questions. This isn’t a lot of new information, but some of it is significant. Read on. KAIJU ADDICTS: A fellow retailer, Michael Cherkowsky of Vampire Robots, attended Diamond’s Retailer Summit in Baltimore last month and spoke with some folks from Diamond and got some rather surprising news. He said that, apparently, the original plan for 24 X-Plus reissues over a one-year period has been scrapped in favor of a different plan. Is this true? DIAMOND: Yes, the plan has been modified due to the time constraints of the licensing. The total count of Godzilla and Kaiju figures is now more like 14. KAIJU ADDICTS: So, we now looking at 12 to 14 figures in total instead of the original 24 previously planned. Is it true that the schedule will now run from January 2016 thru December 2017? DIAMOND: Both of these statements are correct; we are aiming to ship the first ones in January. KAIJU ADDICTS: It was also said that straight re-issues of previous Japanese Godzilla releases are no longer happening. Instead, they would be “retooled if not entirely re-sculpted” and that you’ve “seen first passes at new sculpts”. Is this true and can you elaborate? DIAMOND: At that moment it was true, but this is a very fluid situation. Since the summit, we have been informed that there is now a good chance that we can remake the Japanese releases. I am in Tokyo next week and hope to get this finalized. Stay tuned! 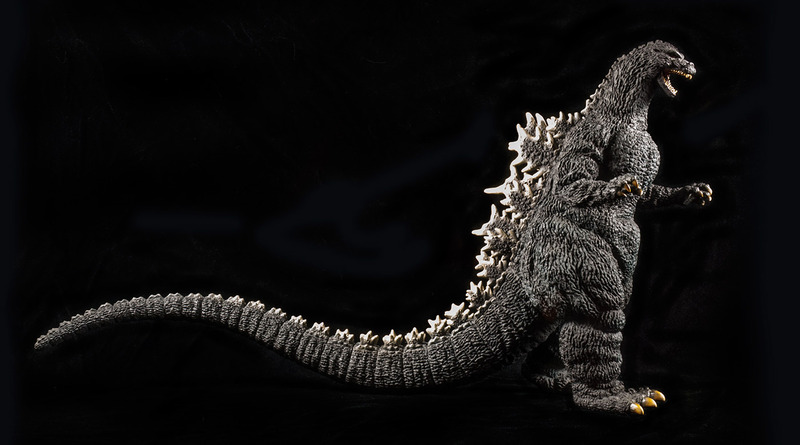 KAIJU ADDICTS: I don’t suppose you can reveal which Godzilla figures are coming our way? 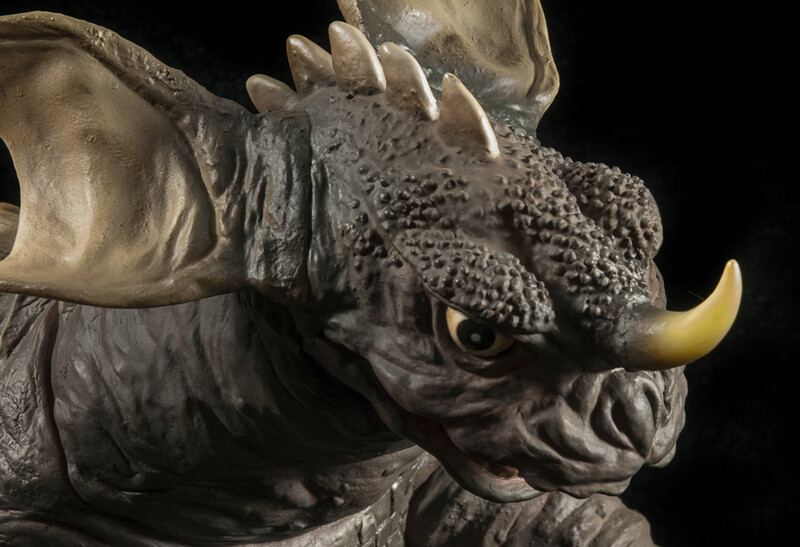 KAIJU ADDICTS: Are we getting any more non-Godzilla Kaiju figures besides the eight already up for pre-order? DIAMOND: AS of right now, that is the list. KAIJU ADDICTS: Bluefin recently announced that they will be distributing the X-Plus Biollante and King Ghidorah re-issues. Why did Diamond let those figures go? [reissues]. Biollante and King Ghidorah may seem large but they are actually to scale with the 8” line [25cm Large Monster Series] which is in Bluefin’s license. • 12 to 14 figures throughout 2016 and 2017. • No definite release dates for any figures other than the first 8 Kaiju already announced. • As of now, no more Kaiju other than the first 8 already announced. That means the remaining 4 to 6 figures will be Godzilla. • I noted a contradiction. He said the license was for 9-12 reissues yet agrees with the 12 to 14 count. Perhaps they are actually licensed for 12 but have plans in the works to try to get two more? • Sculpt modifications to figures may be scrapped and replaced with the original plan to put out straight re-issues as they’ve done in the past. They should know next week. It’s unknown when they will share that information. • No word yet on which Godzilla figures we will get. But that’s also getting ironed out next week when Diamond goes back to Japan. (I think I want this guy’s job!) It seems Diamond may be willing to share that information soon after. • The reason why Bluefin will be selling Biollante and King Ghidorah is all about scale. Despite their size, they are still technically seen as belonging to the 25cm Series. And Bluefin has the license for that scale. Diamond has it for 12 inch figures. • I have no idea why he referred to the Large Monster Series as an eight-inch line. It’s actually almost 10 inches. My guess is there is a range for that license. 8 to 10 inch range or something like that. That’s all I’ve got. As usual, keep visiting Kaiju Addicts for new updates. And don’t forget to bookmark the X-Plus / Diamond Reissue Release Schedule for all facts on one consecutive page. 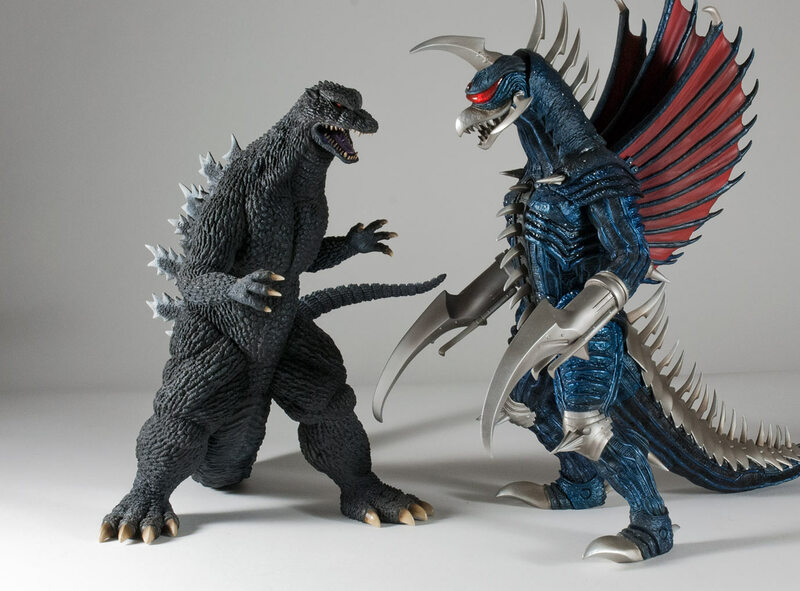 Recently, I posted that Michael Cherkowsky from Vampire Robots had read a press release that the X-Plus Biollante and King Ghidorah which were originally going to come from Diamond Distributors are now coming from Bluefin Distribution instead. Looks like we have our first piece of confirmation on that as this photo from Kevin Leung clearly shows. Biollante is sitting on one of Bluefin’s tables at New York Comic Con along with some Gigantic Series Dragonball Z figures, also by X-Plus. The Toho Large Monster Series King Ghidorah showed up at Bluefin’s booth a little later. Fantastic news for those who missed out on this figure. It really is one of the best X-Plus has done. Let’s just hope they modified their packaging in an effort to prevent another wave of broken horns and necks. Also on display at Diamond’s NYCC booth were the X-Plus Space Godzilla, Kiryu, Gigan 1972, Gigan 2004, Titanosaurus and Rodan. Upcoming X-Plus reissues from the second “Diamond Deal” have finally appeared in Previews, Diamond Distributors‘ bulky, monthly catalog which can be found in comic shops. Advertised are the eight “bad guy” kaiju which we’ve already known about for months now. 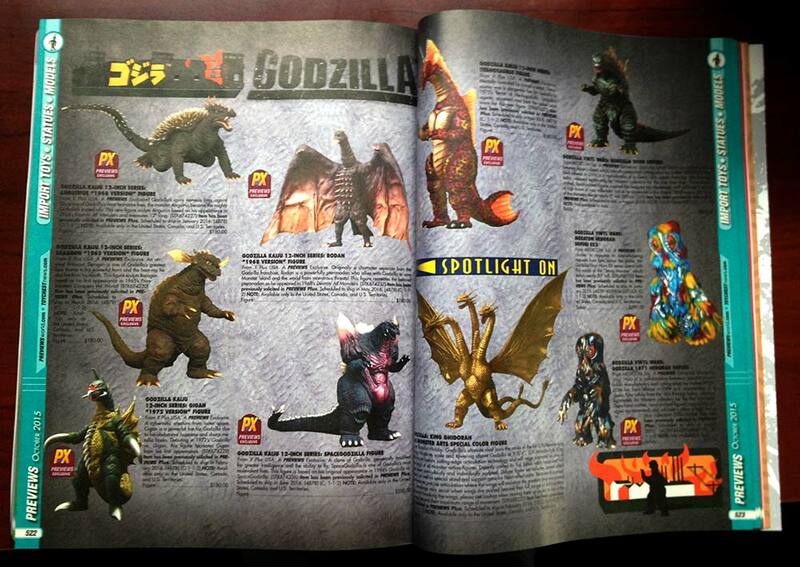 There is no mention of the remaining four kaiju promised us, nor the upcoming 12 Godzilla figures. Most of the new figures can be found in a two-page spread on pages 522 and 523. Kiryu is low in sales simply because he has less of a fan base having come from the very latest Godzilla series in the 2000’s. There are more Heisei fans, that’s all. And even more Heisei and Showa fans. Either way, now that the figures are more out in the open they should be selling more. And we care about this because we want the line to be successful enough for Diamond and X-Plus to fulfill their promise of 4 more Kaiju and 12 Godzillas. Deadlines for Retailers to get their X-Plus orders in has been moved to November 6, 2015. If you are going to order any of these figures from your local comic store, make sure they know the deadline! Keep watching Kaiju Addicts for more updates and bookmark our Diamond Re-Issue Release Schedule! 2nd X-Plus Invasion of North America Begins! 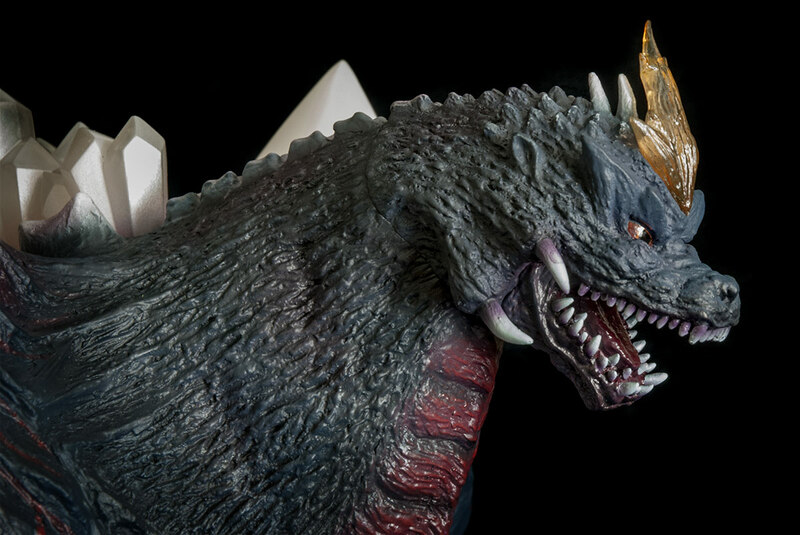 Ultra realistic vinyls based on the Godzilla franchise created by the toy arm of Japanese company, X-Plus, are being made available directly in the North American market once again via Diamond Distributors. These once rare and highly sought after vinyl figures are getting another run for collectors’ money… and that’s okay with us! This new run of re-issues has a new name. It’s now called the “Godzilla Kaiju 12in Series“. Previously, it was called the “Toho 12in Series“. But what’s in a name? 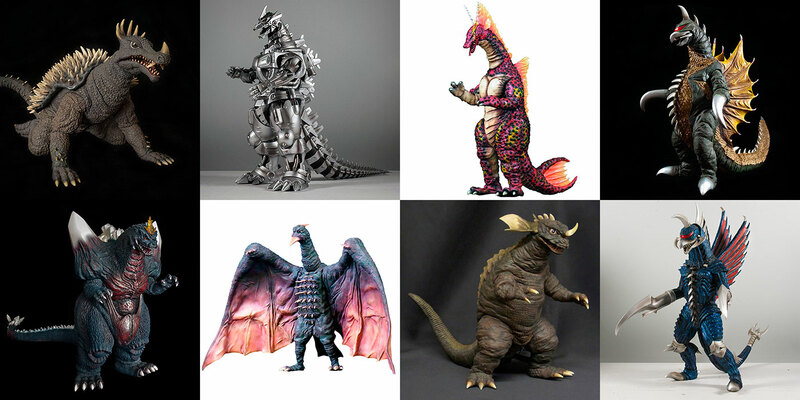 Established fans and collectors usually just refer to them by their original name from Japan, the “Toho 30cm Series“. 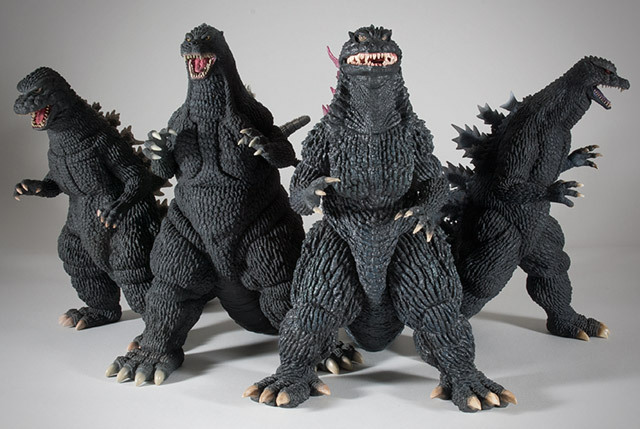 X-Plus originally planned to release 24 figures (two a month; one Godzilla, one foe) throughout a one year period. But, delays with licensing Godzilla himself had caused delays with getting the second X-Plus kaiju invasion started. And so, monsters like Rodan, Gigan and Kiryu are being sent to the front lines first, with Godzilla (hopefully) bringing up the rear sometime soon. In a strange move from Diamond, eight of Godzilla’s friends and foes are available for pre-order all at once. You can order them NOW from comic shops and online stores throughout the U.S. and Canada. The initial deadline for retailers to order is October 26, 2015. But, there is talk of that date changing either forward or even backward. Best thing for you to do is order as soon as possible. Despite the fact that pre-orders are open now for the first 8 figures, each one will be released separately, each in its own month. Anguirus is set to attack first and is expected to make landfall on January 27, 2016. A new kaiju will be released each month afterward. But, again, you have to pre-order them now. 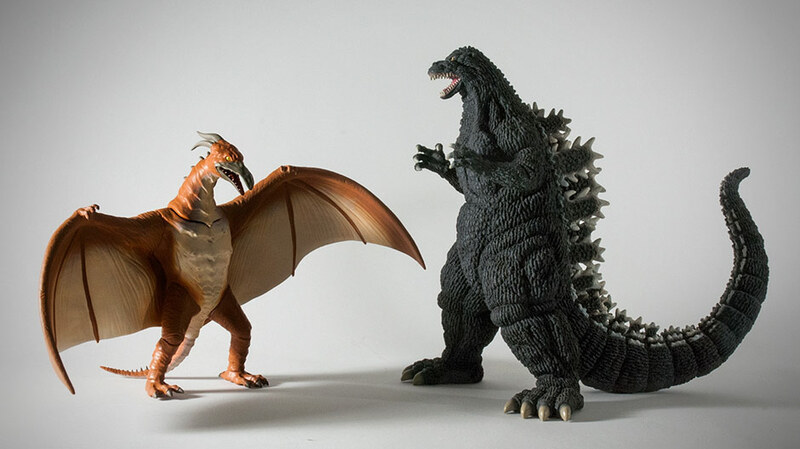 When Diamond Distributors first revealed the first 10 figures for this new deal on their website, they included the X-Plus Large Monster Series Biollante and the Large Monster Series King Ghidorah 1968. Then, suddenly, the figures were removed from the Diamond site, only to appear again last week. Curiously, Biollante and KG were not included. Hopefully, they will be added again at a later date. Keep in mind while planning your budget to juggle the purchases of these “Diamond Re-issues” that when licensing issues get resolved, Godzilla himself will join the fight at some point. New Godzilla re-issues will most likely take up release dates alongside the figures in the above table. If this happens, this will, at some point, change the schedule from one figure a month to two figures a month. I don’t know this for a fact, but I think it’s pretty safe to say that’s what will happen. So, collectors, plan your attack carefully. 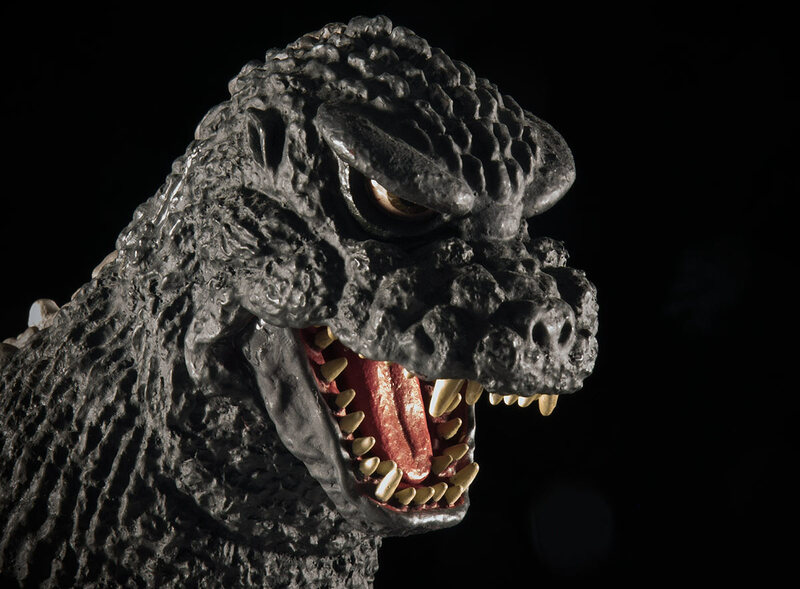 You shouldn’t pre-order liberally from the list above only to cancel some of your orders later to make room in your budget for yet-to-be announced Godzilla figures. When you place a pre-order with a comic shop or online store, they are committed to Diamond to still purchase the figures they ordered for you. Plus, there are still brand new releases (some surprises) coming out of Japan each month eager to nip at your wallets as well! Probably the most obvious place to order these figures is from your local comic store. If anything, you will save money on shipping since you’ll be going to pick them up when they come in. But be warned! I’ve heard many stories from collectors who wound up not getting the goods when ordering from their local shop because they simply weren’t paying attention to the schedule. It doesn’t have to be that way for you. You MUST make sure the guy behind the counter knows what’s going on. Make sure he knows the deadline for ordering from Diamond. Remind him a week before. And check again later to make sure that he actually placed the order for your figures in to Diamond on time. The new X-Plus figures may not show up in Diamond Previews for quite a while still. But don’t worry, comic store retailers have access to Diamond Distributors’ Retailer Website. To help them quickly find the figure you’d like to pre-order, give them the Item Code! They are listed in the table above. TIP: Do this ASAP. And make sure the shop places their order in with Diamond ASAP as well. Do NOT wait for the listed October 26 deadline. 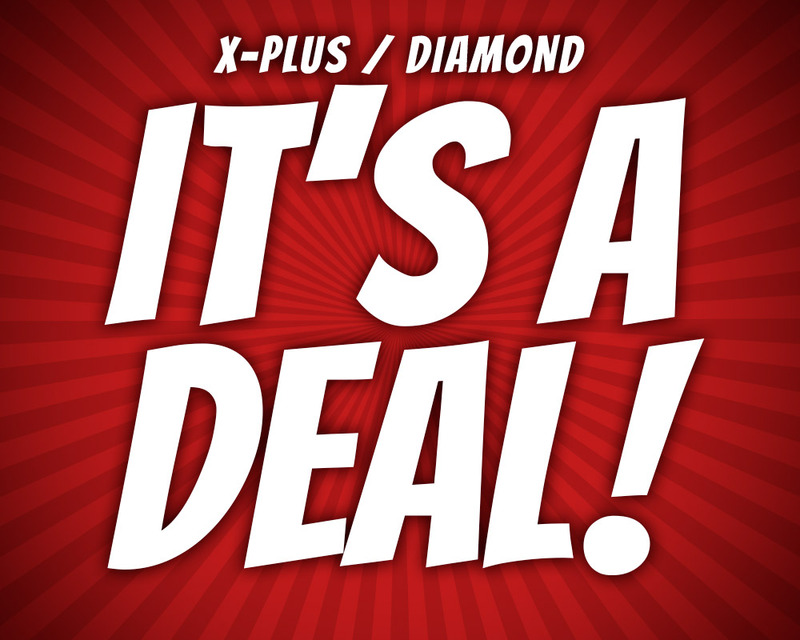 This Diamond/X-Plus deal “seems” to be on a bumpy road this time around with delays, odd decisions, etc. So, better safe than sorry. X-Plus / Diamond Re-issues are currently available for pre-order from Big Bad Toy Store as well as some smaller shops like Vampire Robots and Flossie’s Gifts & Collectibles. Even though they’re not on board quite yet, other stores like Entertainment Earth and even Amazon have carried these figures before and will most likely again… once they catch on that they’re available again. As for those time limits. The best thing to do to attempt to ensure you get your figures is to pre-order as soon as possible from a store who is also ordering them as soon as possible. However, latecomers should still have ample opportunity to secure one of these figures regardless of the October 26 deadline. That deadline is for retailers. There’s no reason why some stores wouldn’t place their orders in to Diamond without waiting to see how many customers they have yet. So you may see wildly varying deadlines from site to site. You may be a life-long kaiju fan who was unaware of X-Plus until now. Feel free to browse around KaijuAddicts.com for more information on these fantastic vinyl figures. There are written reviews by myself as well as tons of video reviews by others which you can watch right here. When you’re done, make some popcorn and visit Rich Eso’s YouTube channel for non-stop reviews. And don’t forget to check out his home base at FreshVinylHQ.com. And for more one-on-one, join the X-Plus Kaiju Collectors Club Facebook Group where questions and answers whiz by daily as well as a steady stream of photos from collections all over the world. The second X-Plus invasion of North America has started! Plan your attack, get your pre-orders made and make some room on your shelves for some wickedly awesome and freakishly accurate vinyl figures from X-Plus which were rare and pricey up until now. It is a FANTASTIC time to be an X-Plus collector, and all around Kaiju fan! If you’d like to help spread the word on the upcoming X-Plus vinyl figure re-issues licensed for North America, I’d be happy to provide you with some big photography on some of the figures. Just contact me at the email address at the top of the page. X-Plus and Diamond back together again for more North American Re-issues! It looks like Diamond will be importing X-Plus vinyls yet again! Retailer Michael Cherkowsky broke the news when he posted photos of the Diamond Distributors table today at Toy Fair in New York. Up-to-date news will be posted here in this pinned post. • A new source say that King Ghidorah will be offered, as well as Biollante! • There will be 24 releases over 12 months. 12 Godzilla and 12 Kaiju. • Could be a mix of both the Large Monster Series (25cm) and the 30cm Series (12inch). • Solicitations start in July. Note: It sort of feels like X-Plus is setting North America up for a classic Japanese release schedule with a couple new figures every month. This could be GOOOOD! 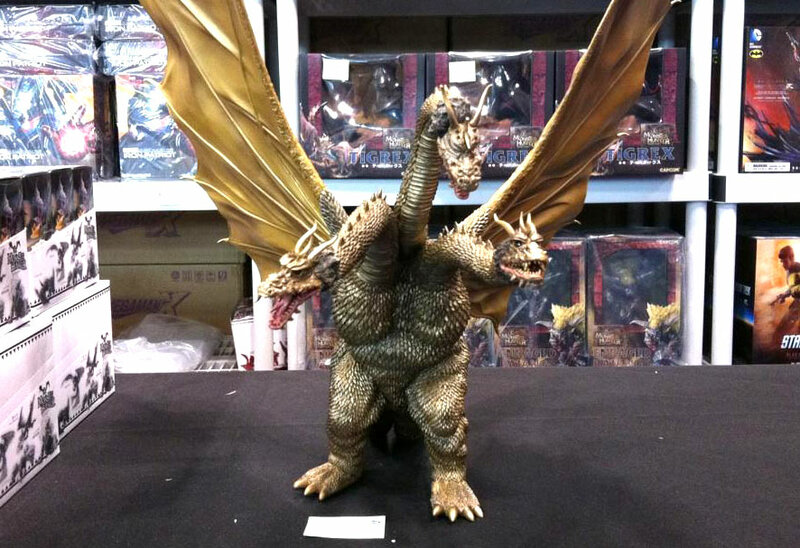 • Michael Cherkowsky visited the Diamond table at Toy Fair and posted photos of the Large Monster Series King Ghidorah which was said to be simply a “placeholder” to indicate that they would be carrying X-Plus again. He also said that he was told that there would be 24 figures in this new deal. TWENTY-FOUR! I will attempt to confirm this with Diamond on Monday. • Word got out that X-Plus Dragonball figures will now be carried by Bluefin for North America. • X-Plus told me that they were about to have a meeting to attempt to seal the new deal, but that nothing was certain. They also said that Gamera and Ultraman figures would not be included. What a way to throttle collectors’ wallets. We’re getting blasted with Mothra, King Ghidorah, the Holidays and now FOUR re-issues all at the same time! But WHY?? Diamond has to get Wave 7 out before their contract with X-Plus, Toho, Plex, etc. runs out which is at the end of the year. Also, in order to make the deadline, Diamond couldn’t wait around to see how many figures needed to be made in Wave 7 so they had to guess. But don’t fret, looks like every retailer who placed an order is going to get them filled. So, depending on who you are, this is either really good news, or really bad news. If you ordered Wave 7 from Flossie’s Gifts & Collectibles, note that we will hold your order for up to a month if you need time for your wallet to heal.